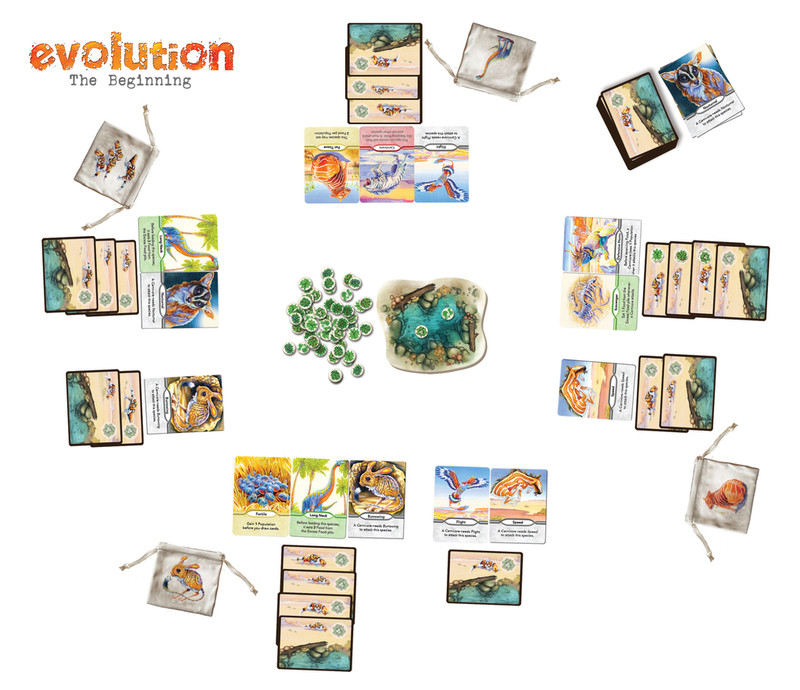 Evolution: The Beginning is the “first step into a vibrant ecosystem of evolution-themed games”. The original game in the series, Evolution, was originally designed and produced in Russia (SEE REVIEW HERE – https://opinionatedgamers.com/2015/05/20/dale-yu-review-of-evolution-northstar-games/) – though a few years ago, the entire product was sold to North Star Games; the game was tweaked by Mr. Crapuchettes and re-released. Since then, a few expansions (Evolution: Flight and Evolution: Climate) have been added to the family. This most recent release is meant to be a primer to the series, targeted as mass market audiences. As North Star Games already sells their games in stores such as Target, they definitely have a pipeline to said mass market. The game idea is the same as the base game – you are trying to have the most successful group on animal species – this is measured by how much they eat. Each player takes a turn in order – following through the same four phases. Step 1 – Gather: You place a single species card from the deck face down in front of you; this represents a new species with a population of 1. You also draw three cards in your hand. You also place 2 Food from the supply onto the Watering Hole. Step 2 – Adapt: You have a number of options that you can do in this phase in any order. You can place any card from your hand facedown on the table to create a new species in your area. You could place a card from your hand facedown on top of existing species card(s) to increase the population of that species. You could play a card face up above a species – this adds a Trait to that species. You may only have 3 Traits per species, and you may not have duplicates. You can freely discard Traits from a species. Finally, you can save as many cards as you like for a later turn (i.e. there is no hand limit at the end of a turn). Step 3 – Eat: Your species can be broadly categorized into two different classes. They could be Herbivores (this is the basic status of all species) or they could be Carnivores if they have a red Carnivore trait card played above them. Each of these two types of species feeds differently. It is important to feed each population unit of a species, because any population which does not eat will starve to death at the end of your turn! Herbivores take food units from the Watering Hole. Place a unit of food on the food spaces on your population cards. Fill as many of the food spaces as you can. Carnivores do not feed from the Watering Hole – instead, they must attack other species and eat their prey. A Carnivore can attack a species if it has traits played to it which allow it to overcome the defense traits of the prey. Essentially, you need to have all of the traits of a prey species in order to be able to attack it. Discard the bottom card from the attacked species – if this was the only card there, then that species is now extinct. 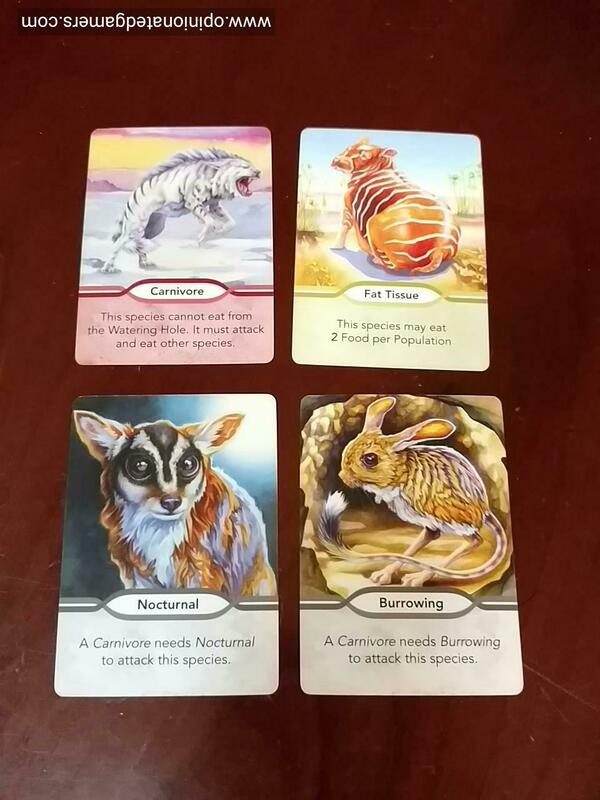 The successful Carnivore gets 2 Food tokens to place on its top 2 Population cards (if it only needs one Food to fully feed its population, it only gets one). The Carnivore must continue attacking until all of its population are fed or there are no more valid targets. This might even mean that the Carnivore will attack other species controlled by the same player! If there are any population cards from the active player which were unable to feed – those unfed cards will be discarded. If the last card of a species is discarded, then that species goes extinct. Any time a species goes extinct – whether it be thru starvation or after being attacked by a carnivore – the owner of the extinct species now discards any trait cards left on the table from that species. The player can then draw as many cards from the deck equal to the number of traits discarded. Step 4: Score: Take all the food tokens from the cards remaining in front of you (i.e. all of the cards left will be fed at this point), and put those tokens into your feed bag. The next player around the table now takes their turn. The game end is triggered with the 88-card deck is exhausted. The discard pile is shuffled to form a new deck, and play continues until the end of the current round (so that all players have had the same number of turns). Then each player calculates their score, gaining 1 VP for each food token in their food bag and 1 VP for each card in their area – whether in their hand or played to the table as a species or a trait. The player with the most points wins. 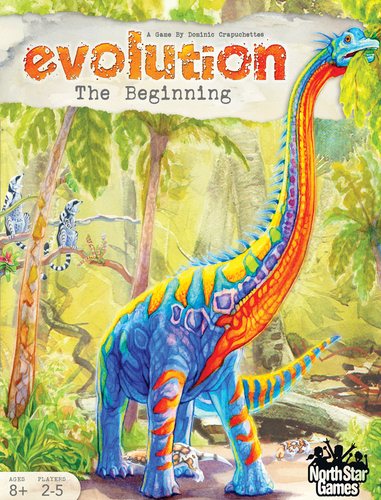 Evolution: The Beginning is an interesting distillation of the base game Evolution. It is probably not for everyone, but I think that this version of the game gives me everything I wanted in the original in a simpler, quicker version. Evolution: The Beginning has been made much simpler through the reduction in trait cards. No longer are there huge chains of traits that work symbiotically with each other. Additionally, you no longer have to match up attacking traits and defensive traits (that had different names) – now you simply have to match traits to be able to attack. The game is also made simpler by removing the concepts of body size and adjacency. So, the game is easier to play – just match up traits with traits and attack! The game also is kindler and gentler. 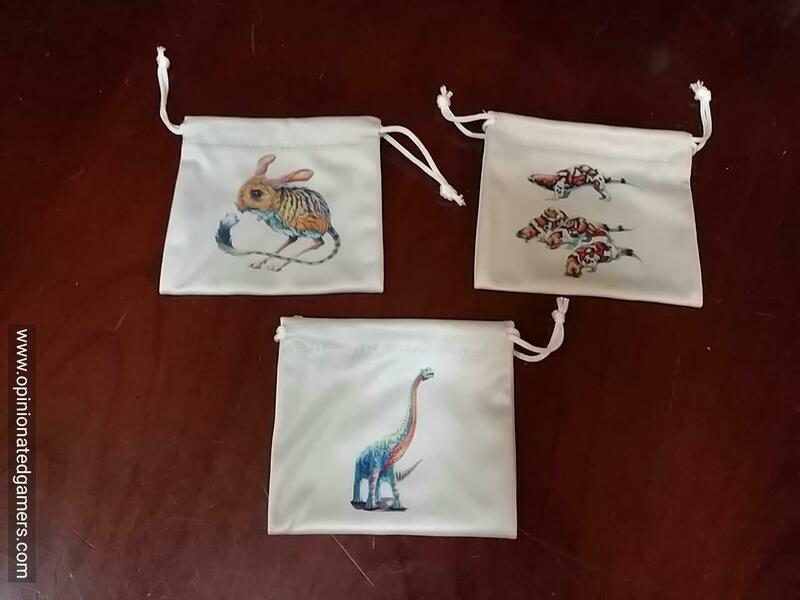 The rules force each player to add an extra species to their area each turn as well as two food tokens to the watering hole. This makes it much harder to run out of species – you generally will be able to do something on every turn, even if it’s just feeding the species you just put out (or using the just played species as an easy target for your carnivore). We haven’t seen any of the runaway leader issues that the base game of Evolution sometimes devolves into nor have we seen the unstoppable Carnivore problem. We also haven’t seen someone be frustrated by the game when you can’t get your species engine running and you end up just being fodder for the carnivores each round. Though I didn’t think this would happen when I was given the game, Evolution: The Beginning has actually turned into my preferred version of the Evolution family. I still get enough strategic decisions to make it interesting for me, but I can also easily pull this one out and play with just about anyone. As the game is being sold exclusively at Target, it is obviously meant for the masses – and it definitely hits that audience. I love the fact that it’s still a game that I want to play as a hobby gamer. I wonder why Dmitry Knorre, Sergey Machin are not credited as co-designers, since this apparently only simplifies and develops their original game. I’ve never played the original card game so I do not have first hand experience of it. However, I think the reasoning was that there was enough redesign and redevelopment in the base game to essentially make Evolution pretty much a new game? This card game version was then a redevelopment of the base game, one further step removed from the original. Streamlining/redeveloping and designing a new game are not the same things, though. Of course, streamlining a game changes the game, but from Dale’s description, it is still Evolution. Development work is very important, as Dale can attest to with his work on Dominion, but even with all the hours he and Valerie Putman put in, Donald X. Vaccarino was still the designer. I think it’s perfectly fine for a developer to get credit for his/her work–even on the box, if the original designer agrees–but the original designers still need to be credited for the game that was developed. I only played this one once back in April, but I agree — seemed to be even more enjoyable than the base game! The streamlining was great! Oh, and Dom says (https://www.boardgamegeek.com/article/23446840#23446840) this was NOT designed as a mass market game! I played the original Russian version when it first came out, and liked it although it had its problems. This 2nd try at redeveloping that game certainly sounds interesting and worth a try. Thanks, Dale, for a well-written review.